I love making our homemade buns, but on occasions, I do buy the store variety. They are an easy alternative as breakfast for the kids or as a special snack for their lunchboxes at the end of the week. 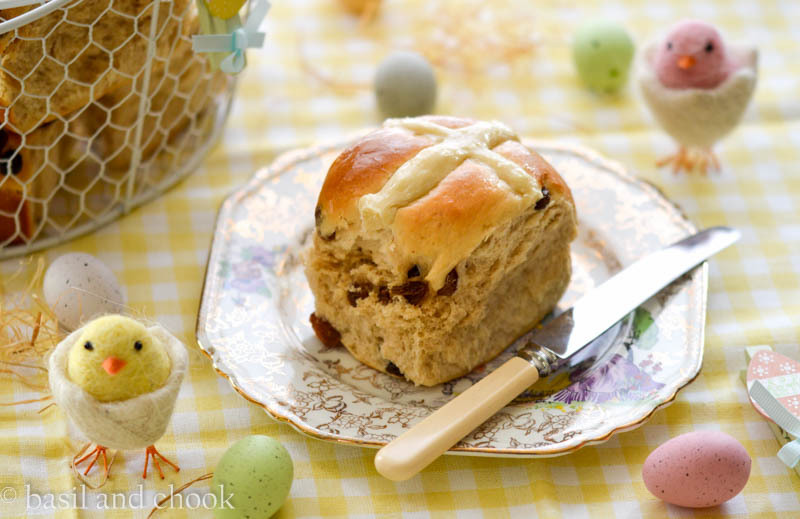 I tend to leave our special homemade Hot Cross Buns for the traditional Easter weekend. Now when I do make our home baked buns, I have always made them a regular size that I see most Hot Cross Buns. However this time I wanted to see how they would turn out if I made them big. How would they be if I made them twice the size? They turned out great. They are soft, delicious and huge! The kids wanted to eat them straight away, and they weren’t even their favourite choc chip variety. 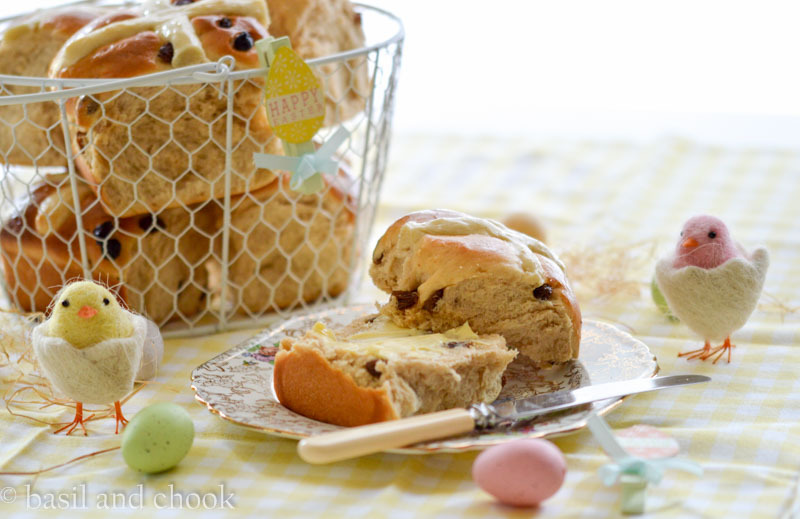 Here is my scrumptious recipe for Mega Hot Cross Buns! 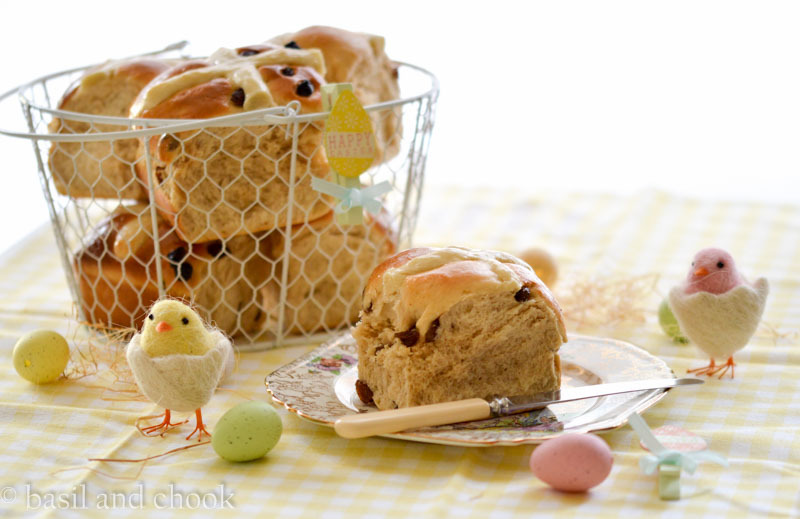 A perfect Easter treat of deliciously soft traditional Hot Cross Buns. In a small bowl or jug combine the lukewarm water, 1 tablespoon of sugar and yeast. Whisk it together and let it stand for about 10 minutes. The mixture will become frothy. Pour the yeast mixture into the bowl of your mixer, then add the egg, melted butter, ⅓ cup of sugar, 1 teaspoon of salt, 2 teaspoons of cinnamon and 2 cups of flour. Mix until combined using the dough hook attachment on your mixer. Then add the remaining flour (2¼ cups) and continue to mix until it becomes a nice soft dough. Transfer the dough onto a floured board or bench top and knead for 2 minutes. Place the dough into a lightly oiled large bowl and cover the bowl with plastic wrap. Leave the dough to rise in a warm place for at least 1 hour or until it doubles in size. Preheat the oven to 190°C / 170°C fan forced. Lightly spray a rectangle tin ( I used a 18 cm x 27 cm) with cooking oil spray, set aside. Lightly flour your bench top and carefully remove the dough. Gently punch the dough out and add the ¾ cup of sultanas. Carefully knead the sultanas into the dough for about 1 minute. Cut the dough into 8 equal pieces and roll each one into a roughly shaped ball. Place the balls into the tin, cover with a clean towel and let them rest for another 30 minutes or until doubled in size. To make the crosses, mix the flour and water together to form a smooth thick paste. 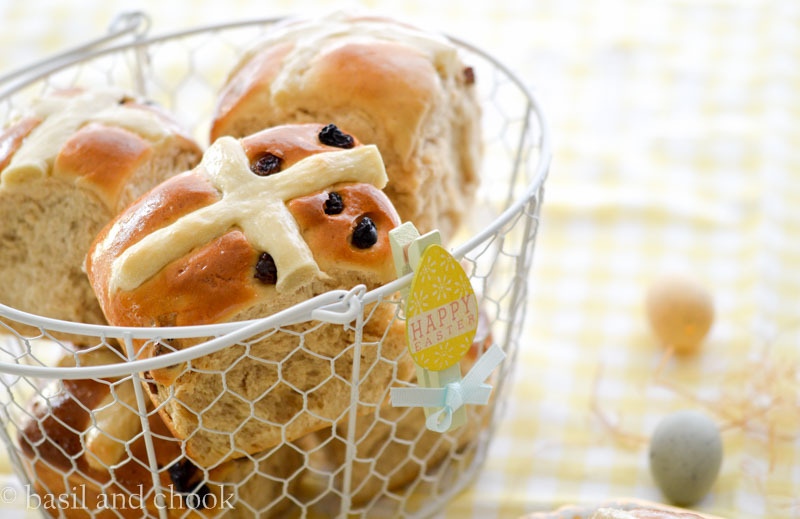 Spoon into a piping bag with piping nozzle and pipe the mixture in crosses on top of the buns. Remove the buns from the oven and carefully transfer them to a cooling rack. To make the glaze, mix the 1 tablespoon of hot water and 1 tablespoon of caster sugar until the sugar dissolves. I covered my cooling rack with baking paper before I glazed them. It prevents the glaze going all over the rack. Brush the glaze over the buns while they are still hot. 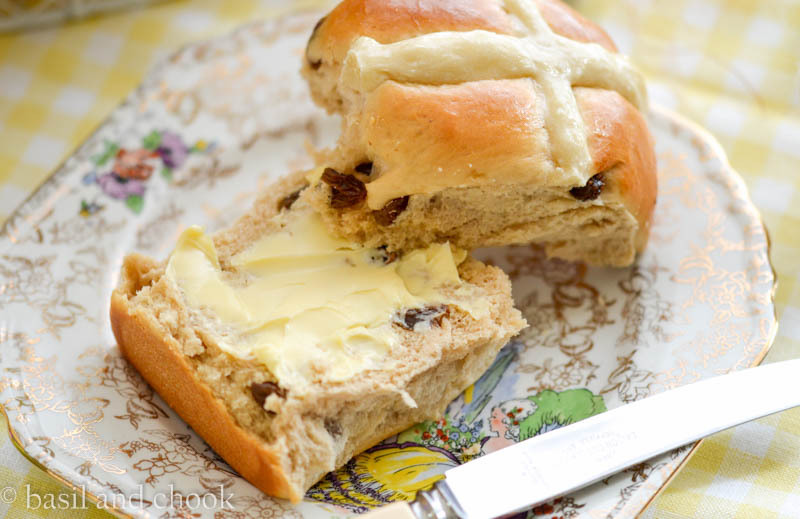 Leave to cool slightly then you can indulge in warm hot cross buns smothered in a thick layer of butter or however you like eating your buns, enjoy! We loved eating our Mega Hot Cross Buns lightly toasted under the grill then we smothered them in a thick layer of butter. Sometimes though we just heat up the bun and eat it warm with nothing on it or we might feel adventurous and add some homemade jam. 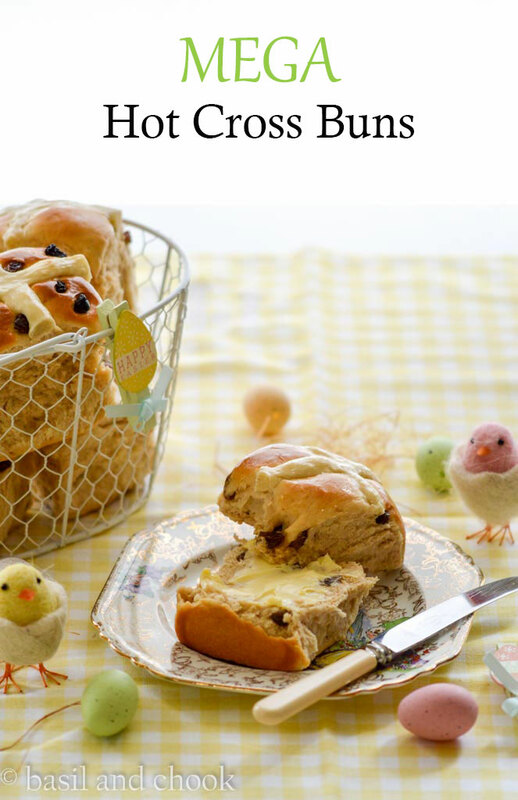 How do you eat your Hot Cross Bun? Warm, lightly toasted, smothered in butter or jam?